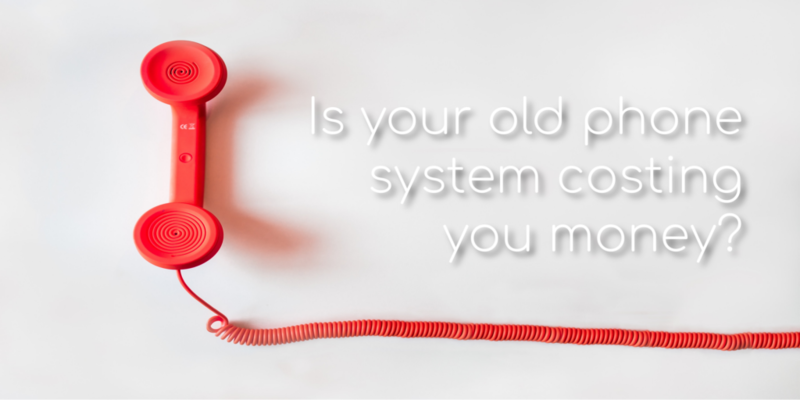 Is Your Old Phone System Costing You Money? There comes a point in time in every business’ life where you will need to upgrade your legacy (old) phone system. If you’re like most businesses you are probably fighting against this, hobbling along with your old system. There are several reasons why companies do this. One excuse might be that their employees are afraid of changing to a new system and not understanding it. And no one believes that their phone system will suddenly up and die on them in the middle of a work day (it does happen, and usually at your busiest time!). But the number one reason people say they don’t want to upgrade their phone system? That they can’t afford it. True – a phone system is an investment, but have you considered what your old system may be costing you? Phone systems are, at their core, a computer. And, like all computers they start to wear out and become glitchy. Do you find yourself having to call your business telephone vendor to come and reprogram your system? Or does a part go bad, and your stuck with a high bill? As legacy phone systems age their parts become harder to source and become more expensive. We were recently cabling in a bail bonds agency in preparation of their upcoming new phone system installation. They were using a decades old phone system that repeatedly lost audio when a potential customer was calling in. Each of those calls represented a potential customer. How much is a customer worth to you? Can you afford for dropped calls? Or what about when your phone system (inevitably) fails? How many customers will you loose out on when you are without phones for several days? New phone systems come with a plethora of new features that will help your employees work more efficiently. Features such as voicemail-to-email make it easy to save and file messages away, and not have to go through millions of messages to find the one you’re looking for – or risk accidentally deleting information you need. Remote phones and cell phone apps allow you to work from virtually anywhere. Legacy phone systems work on traditional analog lines. But what about things like SIP trunking? Or voice over IP? New phone systems will allow you to take advantage of new technology that may be able to save you money in other places. If you’re ready to take the plunge and talk to someone about upgrading your old phone system, give us a call at 443-201-8074, email us at info@tcctelecom.com, or head over to our Contact Us page and we’ll be in touch with you shortly.